oogaa® truck spoon wins an Academy Star New Arrival Award, from the prestigious Cribsie judges. The oogaa truck spoon has won a, Cribsie New Arrival Award with an Academy Star! This award honors the best products of 2014. 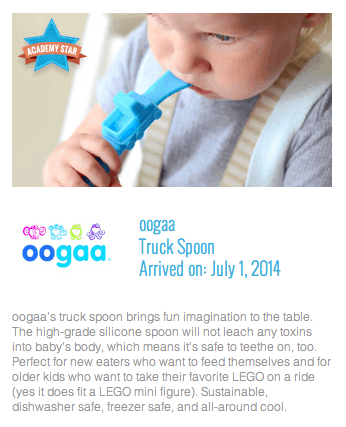 I was asked recently what my favorite product was and I would have to say, I love the oogaa truck spoon! It is designed with a tiny flatbed that can hold a blueberry. When your child grows it even works with a lego minifigure in tow. I poured loads of time and love on this design with help from Oxford Product Design, Oxford England. Since 2002 they have been doing all of our 3d drawings and consulting on tooling design. A very long wonderful partnership! We are so pleased that ALL of our transportation spoons are now Award Winners, go oogaa! My two year old loves this spoon! So cute & fun to play with too.